In the spirit of shared responsibility, Dig Safe and our regional M.U.S.T. groups have joined the Common Ground Alliance in their regional partnership program. Together we share knowledge and experience to make strides in preventing underground utility damage and to promote communication among all stakeholders about Best Practices. Excavator Manual – A comprehensive pocket manual that offers information about Dig Safe operations, excavator requirements, and safety tips. Home Owner Brochure – For the Do-It-Yourself crowd. CGA Best Practices Field Manual: A compilation of Common Ground Alliance’s National Best Practices in a portable, easy to read manual. Free On-Site Training - Keep your employees safe and informed with a safety presentation at your company location. You'll learn about the damage prevention process, the importance of compliance, safe work practices, and a complete overview of the "Dig Safe" law. Classes can be tailored to meet the specific educational needs of a company or group. Bring your questions! Classes book early, so please schedule as soon as possible. Contact Lisa Powers, Dig Safe Public Relations Director, at 781-721-1191 or lpowers@digsafe.com. Here is helpful information about how to respond if you hit a utility line, and also how to stay safe when faced with particular challenges while performing certain types of excavation. Stop work and evacuate the site. Call the appropriate facility operator. Don't do anything that could cause a spark. Alert everyone on the premises. Keep the public and traffic away. Tape, rope or place cones around the area. Stay upwind of blowing gas. Do not try to fix a gas pipe. Do not try to extinsafetyguish a gas burning fire, unless there is a threat to life. Stop work immediately and warn all persons in the vicinity, including emergency and rescue personnel, that the ground and objects near the excavator, and equipment around the point of contact, may be energized. Contact the electrical utility operator and fire department immediately if a radio or phone is at hand. Otherwise, remain still and signal for help to relay a call for utility and emergency assistance. Personnel on the ground near the excavator or point of contact should remain still with both feet together. Don't touch the excavator, nearby equipment, structures or material. Evacuate the excavator and the area near the point of contact only after an official of the electric utility deems it is safe to do. Move a safe distance away (at least 25 to 30 feet) using short hops or shuffling steps to keep both feet together at all times. Do not take normal, walking steps. Do not resume work until an electric utility official confirms the site is safe. Stop excavation and secure the area for public safety. Notify facility owner of the potential damage to copper/fiber cable. Do not examine or stare into broken/severed/ disconnected fibers/fiber cable. Place warning or barricades around the fiber damage location to protect the public and other workers from exposure. Do not view broken fiber cables with any optical instruments. A blocked sewer line may be the result of another utility line which was accidentally "cross bored" through a sewer line during the trenchless construction process. When this happens it may take the sewer line a long time to become blocked and the excavator who caused the damage may be unaware of what has happened. If a sewer blockage is then cleared with mechanical clearing tools, there is a risk of cutting through the utility line which is causing the blockage. This in turn could result in a loss of utility service, or if it is a gas or electric line causing the blockage, may result in serious injury or property damage. When engaged in trenchless construction operations, limit the risk of a cross bore situation from occurring and reduce the risk of serious injury or property damage. Contact 811 and other nonmember utility members in the area. It is very important to ascertain the location of sewer mains and laterals within the work area. If underground utilities exist in the area of the proposed bore path, pothole to ensure their exact location and depth and to verify that a cross bore does not occur. 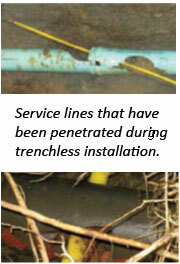 Before conducting a trenchless operation to install any type of facility, first contact 811 and non-member companies.